To make Karnataka ‘Congress-mukt’, the BJP will have to address internal dissidence, build a new social coalition and a compelling development agenda. Amit Shah has set an ambitious target for the 2018 Karnataka Assembly elections. Called Mission 150, Shah wants to win two-thirds of the 224 strong Karnataka Legislative Assembly constituencies. However, the master strategist and tough-talking disciplinarian faces an unexpected challenge: internal party squabbles, primarily targeting the state party president and chief ministerial candidate, B.S. Yeddyurappa. An old RSS Karyavaha and a tireless organizer, Yeddyurappa faces considerable opposition. He is known for his short temper, nepotism and authoritarian tendencies, making even his close associates quite wary. James Manor, the veteran political scientist, provides the most compelling political portrait of Yeddyurappa. Describing the despair that two BJP activists had expressed about Yeddyurappa in 1994, Manor wrote in 2011 in the Economic and Political Weekly: “It was the only time in 40 years of studying Karnataka’s politics that I have seen someone weep in frustration with his own party’s leader”. Despite such strong antipathy within the party, the BJP cannot win without Yeddyurappa, who is considered to be the tallest Lingayat leader. Charges of corruption may have kept him out of the Modi cabinet, but not from the state party presidentship. The opposition to Yeddyurappa has come from two sources. Although he has been associated with the Sangh Parivar for five decades, RSS groups under the leadership of union minister Ananth Kumar have quietly undermined him for decades. More recently, Yeddyurappa has been challenged by an old associate, K.S. Eshwarappa, who had served as state party president and deputy chief minister. Both Yeddyurappa and Eshwarappa came up the ranks in Shimoga district, but have grown apart in recent years. Eshwarappa belongs to the sheep-herding Kuruba community, like the present chief minister Siddaramaiah. Interestingly, as he moved away from Yeddyurappa, it appears that Eshwarappa borrowed from Siddaramaiah’s playbook and has attempted to mobilise support from backward castes with a new organization called the Sangolli Rayanna Brigade. Other state party leaders also seem to have quietly supported him. However, prompted by complaints from Yeddyurappa, the senior leadership of the party has asked Eshwarappa to shut down the Brigade’s activities. With less than a year left for the polls, the BJP state unit seems quite passive. This prompted Amit Shah, who was in Bangalore for an appraisal ten days ago, to exhort the state’s BJP leaders to vigorously criticise the Siddaramaiah government’s performance. 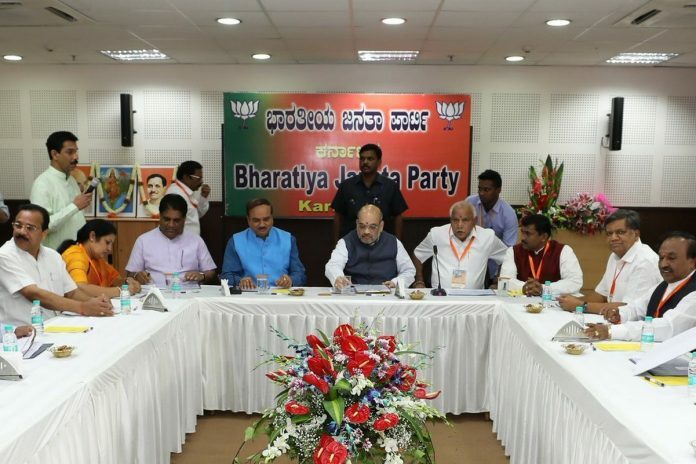 However, Shah may find it difficult to instill discipline in Karnataka, where persistent and acrimonious power struggles marked BJP’s five-year rule between 2008 and 2013. To understand such enduring dissidence, we need to examine how BJP achieved political prominence in Karnataka. Since the early 1990s, Karnataka has been considered the BJP’s gateway to south India. The BJP has since retained its urban Hindu vote base and perhaps even extended it during the Modi era. It also had the backing of the politically dominant Lingayat community. In the last three general elections, BJP has won nearly two-third of the parliamentary constituencies from the state and is expected to do well again in 2019. This success, however, hasn’t been entirely orchestrated by the Sangh Parivar or due to Hindutva ideology. For instance: despite supporting the BJP electorally, the Linagayts have not been proponents of Hindutva. On the contrary, they have been demanding minority status. Thus, the social coalition the BJP built over the past two decades isn’t based on ideological factors, but on more pragmatic considerations. To fully appreciate this, consider the other groups in BJP’s social coalition. In the 2000s, BJP aggressively recruited those Scheduled Caste communities, which weren’t ‘untouchable’ castes; such ‘touchable’ SC communities (for example, Vodda and Lambani) are generally perceived by upper castes to be less aggressive when compared to the more radicalized untouchable castes such as Holeya and Madiga. In fact, BJP won more reserved assembly constituencies in 2008 by fielding candidates from touchable castes. Similarly, BJP also welcomed OBC groups such as Nayaka and Balija, which hadn’t received political representation in Congress. Because all these groups hadn’t been active in either Dalit or backward class politics, upper castes had less reservations about them, helping BJP consolidate their votes. The new entrants in the BJP were among those who had benefited from mining and real estate businesses. In fact, the BJP received more businessmen-politicians than Congress and JD (S), who had caste-based social coalitions already in place. Examples of such new leaders include Gali Janardan Reddy (Reddy caste), B. Sriramulu (Valmiki Nayaka caste) and Katta Subramanya Naidu (Balija caste). And their arrival was the beginning of a structural change in Karnataka politics in two specific ways. Firstly, these politician-entrepreneurs brought money into electoral politics in unprecedented ways, particularly after 2004, helping the BJP achieve political success. Secondly, they sought political power as an instrument to influence public policy to further their business interests. This influx of money has forced even more experienced politicians to become businessmen to fund their political activities. Not surprisingly, Karnataka, under the BJP government, was branded as the most corrupt state in India. Power struggles broke out regularly and dissidence was common. It is this legacy that the BJP has to overcome. True, Modi’s coattails are long and Shah’s election management skills considerable. Communal fires stoked by the fringe groups may even create some momentum. However, to make Karnataka ‘Congress-mukt’, the BJP will have to build a new social coalition and a compelling development agenda. Prithvi Datta Chandra Shobhi is a Mysore-based social historian and political commentator.